Drama with a dramatic backdrop! 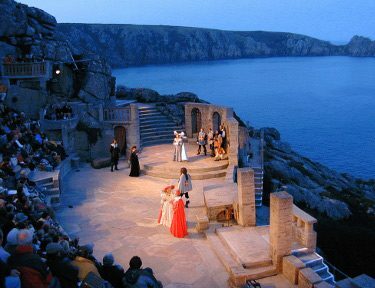 Little Molvenny is the holiday cottage to book if you plan to visit the world famous Minack Theatre being just 5 minutes from the door! 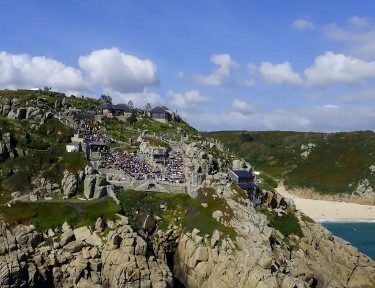 This is no ordinary auditorium, the World Famous Minack Theatre is perched high above the Atlacntic coast, built into the actual cliffs of Porthcurno. No stage hands have had to paint this theatre's backdrop ... nature itself provides this both day and night. 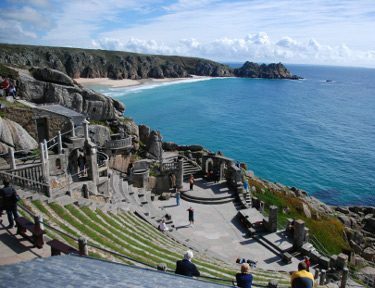 The auditoirum is designed like an amphi theatre where the audience sit on steep curving grassed steps and look down onto the stage ... unlike any other theatre you will have ever visdited, there are no ropes and pulleys to move this stages 'backdrops'. Built in the 1930's by the formidable Rowena Cade, who not only designed the theatre but took part in it's physical construction. 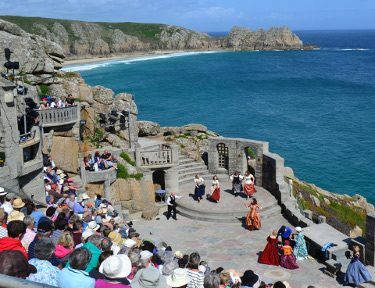 Today the theatre offers a full programme of open air performances, drama, comedy, musicals and opera, twenty weeks a year (May to September), with matinees two days a week, and morning children's shows. 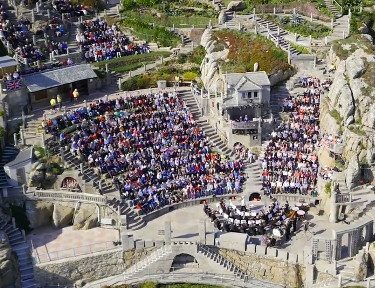 Our thanks to the Minack Theatre for the use of this video that gives you a spectacular birds eye view. Cinemas: Newlyn has a new and wonderful cinema with a lovely restaurant/bar/café. It is well worth going on a rainy day. Newlyn Filmhouse: 23-31 The Coombe Newlyn TR18 5HS Tel: 01736 33 22 22 The Savoy cinema, Penzance: 16 Causewayhead, Penzance TR18 2SN 01736 363 330 The first Merlin Cinema to go completely digital as well as the welcomed addition of Digital 3D. Royal Cinema, St Ives: Royal Square, St Ives, TR26 2ND 01736 796843 Also a Merlin Cinema.